People in New York generally don’t wear a ton of color. Most of the time there’s a sea of black, gray, and navy filling the sidewalks. I, on the other hand, love to wear color. I found this 3.1 Phillip Lim dress on sale at Bergdorf’s last week and thought it was pretty hilarious that such a perfect burnt orange piece was not found in Texas (hook ’em)! While it was the shade that initial drew me in, the easy silhouette sold me. Plus, who can say no to pockets? On another semi un-related note, my favorite Netflix show comes back next weekend! If you couldn’t guess it from the title of this post, it’s Orange Is The New Black. So good! PS – NET-A-PORTER launched their sale yesterday and you know how much I love their sales. I’m like a kid in a candy shop! Enjoy up to 50% off your favorite designer duds and summer favorites like this colorful Mara Hoffman coverup or this classic Sophie Hulme shirtdress (love the chain detail!). I can’t stop drooling over this glam pair of heels. Click here to shop all of the crazy good markdowns! You’re stunning in orange! And dying over this bag! That dress is fantastic and fits you so well. Such a beautiful dress!!! This color is perfect for your hair!! This color looks so good on you! That bag is kind of to die for too! Orange looks amazing on you!! Looks like NYC was the perf place for you to grab your color!!! YAY for finding a great steal!!! You look great! So far I’ve loved all your NYC outfits! Love that orange color on you! Do I see the meatpacking district in the background? Love that area. That really is the perfect dress! Love it! Love this dress on you- perfect shape and love that it has sleeves! Great dress! What a snag – I naturally gravitate towards that color too. Hook em! This color is great on you. The bag is everything! it really is so perfect! You look stunning in color! 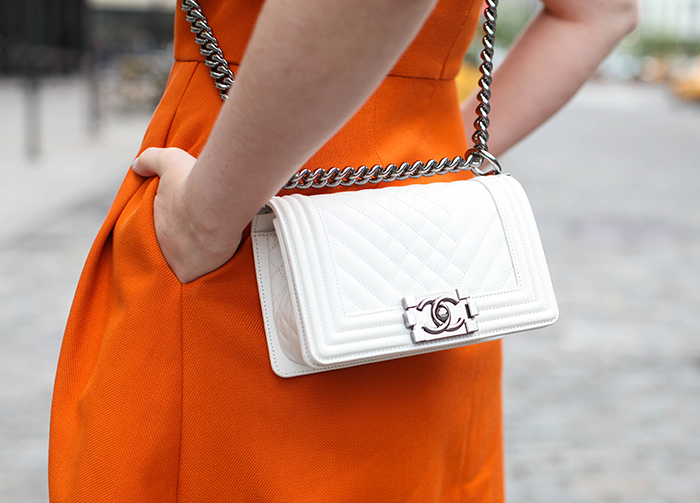 And that purse…love! So glad to be following you because I just love your style! I love the shape and color of that dress on you! It is funny you found in NYC as I immediately thought UT when I saw the color. I hope you are having a great time in NYC! Gorgeous orange dress, absolutely love it! I’ve been on the hunt for an orange dress, too! I love the color of this one, and that you paired it with white accessories. You look flawless! The perfect summer dress! I definitely need to infuse some orange into my wardrobe. Paired with white, it’s such a fresh and crisp look! Yes I know it is so true. I use to wear a ton of black when I lived in NY and Seattle. I was even a goth back in the day. But yes I am tired of all black and do want to incorporate more color in to my wardrobe. Orange and white is a stunning combo! Such a great silhouette and color! And I love pockets on dresses! Great look! Orange looks awesome on you!! Such a beautiful color! I love the orange – and the title of the post is perfect! What a fabulous find! I love the style of the dress, such a great cut. Even with the fun color, I feel like this is defiantly a piece that will last you for years! Thanks so much for the heads up about the Net-a-Porter sale, heading to check that out right now! That dress is GORGEOUS! I love the detailing on the sleeves. Honestly, what I love most about this post is your smile. So happy! LOVE that dress! Burnt orange is one of my favorite colors to wear and it is nearly impossible to find. Love the bright pop of your white accessories… I want those Proenza heels desperately, but they’re sold out :( Please let me know if you see them anywhere else! This color is GORGEOUS on you! Hook ’em Horns! Orange is certainly your color, Merritt! Loving this dress! Hope you had a great time in NYC. Sad I missed you. That orange is AMAZING on you! What a great find! Love that you found that Texas orange in New York. Despite being a diehard Red Raider, I must admit that burnt orange looks beautiful with your light hair and fair complexion. It pains me to say that (Ha! ), but it’s true. Great color on you! Love the bag too! Your body looks amazing in this dress!! !